The borough’s most recent comments to the Federal Energy Regulatory Commission “simply nit-pick (erroneously, in many instances) around the edges,” the Alaska Gasline Development Corp. told federal regulators Feb. 13. 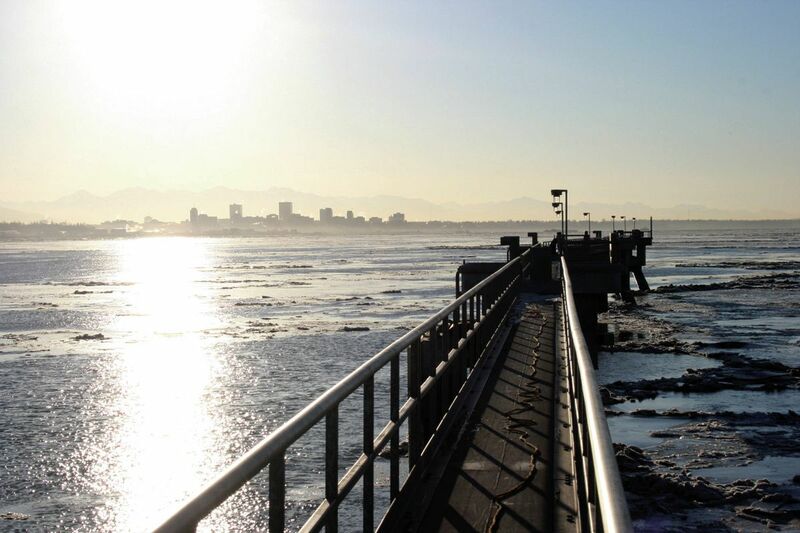 The corporation has not strayed from its choice of Nikiski on Cook Inlet as the best site for the gas liquefaction plant and export terminal. The borough, however, is contesting the state-led project’s evaluation of Port MacKenzie at the entrance to Knik Arm, across from Anchorage, about 65 air miles northeast of Nikiski. Both AGDC and the borough are adding to the file at FERC, which is preparing the project’s environmental impact statement, or EIS. FERC is scheduled to release the draft EIS by the end of February, followed by public hearings and comments, along with comments from federal and state and municipal agencies, and then, if the environmental review stays on schedule, a final EIS in November. Federal law requires that an impact statement review economically feasible alternatives to a project developer’s preferred options to determine the “least environmentally damaging practicable alternative.” The Mat-Su Borough argues that AGDC has failed to give Port MacKenzie fair consideration. The proposed $43 billion project would move Alaska North Slope gas to a liquefaction plant for export. The state corporation and the Mat-Su Borough, along with the Kenai Peninsula Borough in its defense of Nikiski, have all contracted with Washington, D.C., law firms that specialize in work at FERC. Neither AGDC, the Mat-Su Borough nor FERC have raised any questions or added anything to the docket regarding the 7.0 earthquake that shook the Anchorage area on Nov. 30 and was centered about 5 miles north of Port MacKenzie. Separate from the debate over the borough property, AGDC still owes a substantial amount of data to FERC, along with answers to more than 100 detailed questions about engineering and safety systems for the LNG plant, the gas treatment plant at Prudhoe Bay and the 807-mile pipeline from the North Slope to Nikiski. The corporation has said it will be September before it provides all the answers. Federal regulators have not said if that timeline for the missing data will affect the EIS schedule. Not true, AGDC told FERC on Feb. 13. Regardless of which exact site is mapped out at Port MacKenzie, there are multiple problems with building the LNG plant and marine terminal at the property. The state corporation restated its concerns over conflicts with more frequent vessel traffic in the navigation channel to Port MacKenzie (across from the Port of Alaska) than in Nikiski; more significant ice conditions than at Nikiski; restrictions on when construction delivery ships and LNG carriers could cross the Knik Arm Shoal; and the impacts and restrictions of building in the critical habitat area for endangered beluga whales. AGDC also took issue Feb. 13 with the borough’s analysis of berthing facilities, water depth, dredging and other issues at Port MacKenzie. And the state team told FERC that the existing haul road from the dock to the property is too steep to transport large modules to the upland construction site, regardless what the borough contends. “In short, the Matanuska-Susitna Borough’s attempt to substitute its erroneous analysis for AGDC’s rigorous analysis and conclusions as to berthing and other design elements needed to construct and operate the project facilities reliably and safely should be rejected,” the corporation’s lawyer wrote to FERC. The borough a year ago stepped up its complaints to federal regulators over AGDC’s analysis of Port MacKenzie as a potential site for the development. The borough charged that AGDC may have violated the National Environmental Policy Act and federal Clean Water Act by “improperly and intentionally excluding” Port MacKenzie as a “reasonable alternative” for the proposed LNG plant. Nikiski was selected as the preferred alternative from more than two dozen options in October 2013, when North Slope oil and gas producers ExxonMobil, BP and ConocoPhillips were leading the project. The state took over the venture in late 2016 after the companies declined to proceed with spending significant sums of money on additional engineering, design and permit applications. The state applied to FERC in April 2017. “FERC has sufficient information to fulfill its responsibilities … to analyze Port MacKenzie,” the state corporation said Feb. 13. The borough’s suggestion that AGDC “should develop a site-specific design for Port MacKenzie … is unreasonable and not required for the commission to comply” with federal law, the corporation said.